Android phones can do more than just answer calls and take pictures. Like digital Swiss army knives, they concentrate a lot of utilities into a compact, pocket-size device. Straight out of the box, your Android phone is a still and video camera, an address book, a GPS navigator, and even a phone. But with the right apps, you can also turn it into a flashlight, a remote control, a barcode scanner, and a compass. Musicians will find that it makes an excellent tuner and metronome. And though it's already an alarm clock and a music player, it can get better at these tasks with the right software. Here are 12 apps--all of them available from the Android Market and most of them free--that can turn your phone into an even better multipurpose device. But not a perfect one. I'm still looking for the right Phillips screwdriver app. DroidLight turns on your phone's camera flash LED to light your way. Have you ever watched someone trying to read in the dark by the blue glow of their cellphone's screen? Have you ever been that person? With Motorola's DroidLight, those days are over. Launch this app, and your phone's camera LED will come on and light the way. 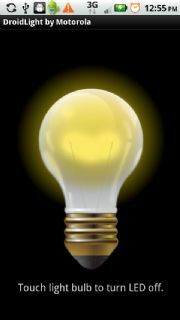 DroidLight's user interface is transcendently simple: An illustration of an old-fashioned, incandescent light bulb. Touch the bulb to turn the light on or off. One caveat: Make sure that you go to another program or return to the Home Screen before putting away your phone. Otherwise, you might accidentally turn the beam back on, and it will light up the inside of your pocket until the phone's battery dies. The DroidLight requires a camera with flash, of course; and it doesn't work on all such phones. It's most dependable on Motorola phones, but it does work on some others, as well. And since it's free, there's no risk in trying it. Your phone has a microphone and a memory. Why shouldn't you be able to use it to record verbal reminders, conversations, and even live music? Though there are plenty of recording apps for Android, I recommend the free RecForge Lite and its $6 big sibling, RecForge. (Until very recently, both versions went by the name AudioRecorder.) The lite version is fine if you're making recordings of less than 3 minutes each. Either app gives you a host of options for handling the recording you want to make. At its default setting it saves recordings as .mp3 files, but you can choose instead to record .wav or .ogg files. Available sample rates range from low-fi but understandable 8KHz to CD-quality 44KHz, and you can choose to record in mono or in two-track stereo. Once you've recorded something, you can attach an additional recording to the end, convert it to another format, or share it via e-mail, Gmail, Bluetooth, or text message. Don't get too excited about the Edit option on the menu, however: That's just for file manipulation; you can't edit the audio in RecForge. Bear in mind, too, that in most places, recording conversations or performances without permission is illegal. I wish I could recommend an app that would turn your Android phone into a universal remote control. But that won't happen any time soon. The problem is that phones don't emit infrared signals--the preferred interface between remotes and the devices they control. This Wi-Fi remote handily controls the Boxee set-top box. There are a few of exceptions, all of them involving controls for devices that plug into your home network as well as into your TV. By turning on your phone's Wi-Fi connection, you can control the device over the LAN. 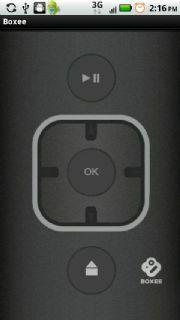 I gave the free Boxee Wifi Remote a whirl. If you've attached a computer to your television so that you can watch movies and TV shows via your Boxee account, this program will permit your phone to function passably as a remote control. It's reasonably straightforward and it works, navigating through the menus with simple on-screen controls, and it even uses your phone's volume control for Boxee. Running Boxee involves entering text occasionally--for instance, if you want to search for a title or an actor. If you've ever tried to enter text with a conventional remote control, you know how much easier it is to use your phone's keyboard instead. And that's despite the fact that the Boxee Web remote got confused when I tried using Swype with it. The developer told me that he has not yet tested this app with DLink's upcoming Boxee Box, but he thinks that it should work. Since I don't own a TiVo, I wasn't able to test Tim Hoeck's TivoRemote. The app costs $1 and is supposed to work with Tivo Series3, HD, or Premiere DVRs. You can control your computer from your Android phone, even if you aren't watching Boxee. The free, open-source RemoteDroid uses your network and Java to ast as another keyboard and mouse for your Windows PC. Preliminarily, you'll have to install the Java SE runtime environment on your the computer and then run the RemoteDroid Server software. And of course, you'll have to turn on your phone's Wi-Fi and get it onto the network. Once you've taken care of those steps, you'll find the user interface minimal but intuitive: You use the big rectangle as a touchpad; the two smaller rectangles are buttons; and (as you'd expect) the keyboard icon brings up the keyboard. RemoteDroid doesn't support Swype, unfortunately. But it does let you lean back and control your computer without having to touch it. And if you hook up your computer to your TV, the app works with Windows Media Center.